Things to do in Essen, best restaurants, shopping districts and the event tourism in the city are explained in details. Essen is the ninth biggest city of Germany, located in the central part of the Ruhr area in North Rhine-Westphalia. Used to be one of the most well-known coal and steel center of the country, Essen now enjoys a rather slower paced business life compared to the past. The estimated population of the city is around 567.000. On the contrary to Essen’s historical past of steel and coal facilities, it is one of the greenest cities in Germany and offers the visitors a great trip to every shade of green imaginable. In addition, it is one of the warmest cities in Germany and the visitors may expect to be welcomed by the expected season averages on their trip to Essen. Essen was chosen as the Capital of Culture for 2010 by the EU Commission. This, as well with the city’s improving place on the Europe’s event scene acted as an ice breaker in people’s minds who regarded Essen as a city that has nothing to offer. The area known as the Ruhr District is no longer an underestimated place in Germany; the image of the city has changed drastically and it is one of the top notch cities in Europe to visit for a wonderful time filled with discovery and a rich culture. Essen may be not be listed among the must visit cities in the world however that doesn’t mean it is not one of them; if you are on your way to Essen to attend an event; a congress, conference, fair or tradeshow, just relax and accept the things the city has got to offer you and enjoy them. Essen is located on the River Ruhr, in the center of the Ruhr area in North Rhine-Westphalia, Germany. How to get to Essen? Essen doesn’t have an airport of its own, however most of the visitors use Dusseldorf Airport to get to Essen because it is located only half an hour from the Essen city center. If you are going to travel from another European country, you can also use the Dortmund Airport and Flughafen Münster-Osnabrück. How to get around in Essen? Essen has got one of the most efficient public transport systems in Germany. The official website of Essener Verkehrs-AG is packed with information the travelers may need. There is also a route planner you can use that suggests the possible means of transportation you can use through your journey in Essen. No matter for what purpose you visit Essen; whether for business or for leisure, this city is going to treat you well with a large number of attractions to choose from. You can also choose from countless places to dine and to shop. 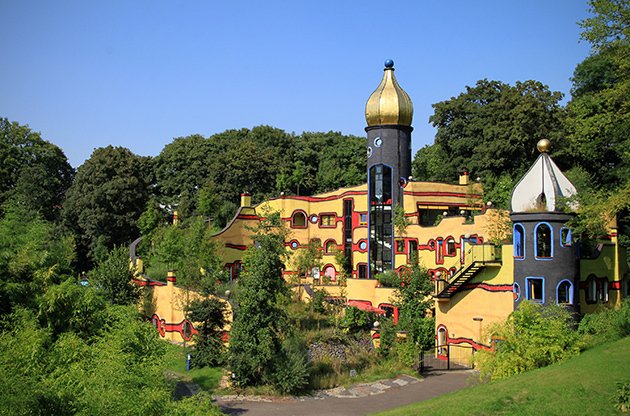 When it comes to excursions, Essen once again is generous; there are so many to choose from. Just make sure you have some free time and see how this city treats you. A trip to Essen cannot be called complete if you don’t visit Zeche Zollverein. It is thought to be the most beautiful coal mine and when coal’s importance for Essen is also taken into consideration, it becomes even clearer why the place is worth a visit. Villa Hügel, Aalto Opera-House, Essener Münster Cathedral and The old town of Werden are also among the must visit places in the city. If you are a museum lover, you must visit the Folkwang Museum. It is one of the best museums not only in Essen but also in Germany, covering the most exquisite pieces from the art of photography and paintings. If your trip falls between the months of spring and summer and if you want to experience the natural side of the city, then you must pay a visit to Grugapark, a park that has got a huge botanical garden, a playground and a large number of attractions to choose from. Essen has got a large number of options to choose from if you are after a fine dining experience. The city is home to restaurants that serve both local dishes and the best examples from the world cuisine. You have the chance to try the Nouveau cuisine; there are many restaurants specialize in this one. La Grappa located in Rellinghauser Str. 4 and Schloss Hugenpoet-Nesselrode located on August-Thyssen-Str. 51, are the two of these. Essen has got a bright nightlife scene. It is possible come across people who travel from the other nearby cities in Germany to spend some good time on the weekend. In Ruttensheid area you can find a large number of pubs and clubs, most of which are open till the early lights of the morning. Essen offers an eclectic shopping experience to its visitors. Most of the stores that sell local items and souvenirs are located in the city center. If your trip falls before the Christmas time, make sure to check one of the best Christmas Markets in Europe which is set in Essen. In addition, Ruttensheid has also got nice shops that sell German items that you may want to take back home with you. Limbecker Platz is the famous shopping mall in Essen. You can find all you need at a time and you’ll come across familiar brand stores there. One of the biggest reasons why Essen has gained much more importance when compared to the previous years is that the investment Essen made on its appearance on the world’s international meeting scene. It is now one of the busiest hubs for fairs and tradeshows in Germany. In addition, a large number of congresses and conferences, as well with symposiums are being held in Essen throughout the year. With the contribution of venues that are equipped with the latest technology to meet the attendees’ needs, Essen will keep its place among the most important event cities in Europe for quite a long time.